Just as a Scottish queen left her mark on a famous staircase in Northamptonshire, Pear Stairs enables people throughout the UK to leave their mark on their homes with the finest stair parts. 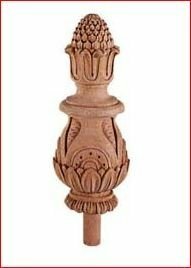 You can also literally 'leave your mark' on a particular piece, thanks to our ability to make custom carvings in newel posts and other stair parts. 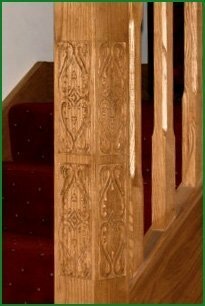 If you literally want to 'leave your mark' on a staircase, you could opt for a carved design, of your own choosing, on one or several stair parts to add interest and uniqueness. We provide this service using the latest CNC (computer numerical control) technology in our workshops. The picture here is of a carving made on an ash newel post, which we provided for one of our many delighted customers. For our metal stair parts, available in Northamptonshire, there’s usually choice of finish. 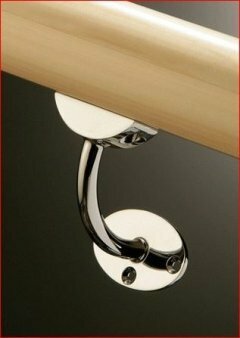 For instance, this handrail bracket from the Fusion range is available chrome-plated (pictured) or in a brushed nickel finish. We also have a complete range of finials – hand-carved or plain – for topping out your posts to best effect. The one pictured below is an extended pineapple finial in limewood. Pear Stairs cares passionately about stairs, and our commitment to providing the highest quality and best service to our customers has made us the natural choice when it comes to choosing stair parts. We provide parts made of softwood, hardwood, metal (including stainless steel and brass) and glass to suit every style – traditional or modern, ornate or more reserved. No matter what type of staircase you have or plan to have, Pear Stairs can help with any Northamptonshire stair parts you may need – and we deliver direct to your door, to Northamptonshire or anywhere in the UK. Don’t worry if your requirement is in any way unusual – our expert craftsmen at Pear Stairs can custom-craft stair parts to match perfectly with any existing style, traditional or modern, so there’s no need to plunder a Northamptonshire castle or any other building to get the precise stair part you need.